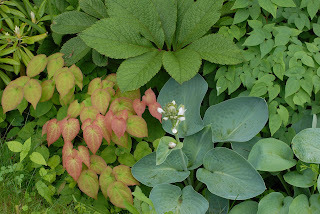 When you want to diversify and expand your plant collection, where do you go to discover new and unusual perennials? Do you shop the big chain stores or do you like to discover the rare find? While you can get great bargains from time to time at the larger chains, your local nursery centers are your best bet for finding an extensive collection of quality plant material. A well-established garden center has trained staff to answer your plant questions and can offer a wealth of information. Visit many and find your favorites. Go to garden tours, plant sales, botanical gardens – the list is endless. There are specialty growers and plant societies that can be tapped into for information and can be a valuable resource for expanding your plant collection. Browsing the glossy magazines is a start in the right direction but if you want to get jazzed about a particular plant, get out and experience it. One favorite perennial for the shade garden is Epimediums. A few features worth mentioning - delicate low-growing foliage, a wide variety of blossom colors and deer typically won’t eat them. While you can find a few different types at local nurseries, this is where a specialty grower is a must. One of the country’s most extensive collections is very close by in Hubbardston, MA. 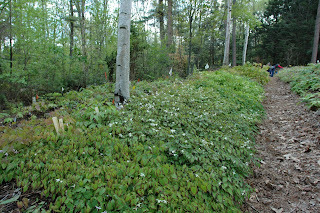 (Garden Vision Epimediums/Phone: (978) 249-3863) Mainly done by mail-order, Garden Vision has open garden days in the spring when you can visit, purchase and enjoy the collection first-hand. Expand your plant palette by discovering the people that love them! It’s bound to be contagious. 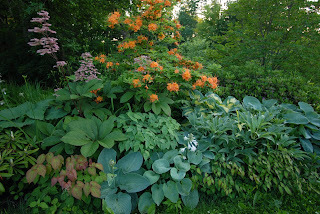 Other photos display our own shade garden collection immersed in some other favorite shade-loving plants. What is thriving in your garden?